Colombian artist Fernando Botero is known for his voluptuous and exaggerated paintings, sculptures and drawings. He studied under Roberto Longhi, a renowned authority on Italian Renaissance and Baroque art, obtaining a remarkable art historical knowledge of Western Classicism. This dialogue between an erudite education and religious art for the masses is the key in the development of his aesthetic. 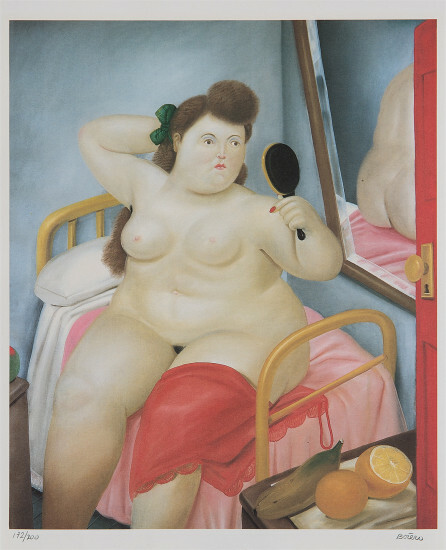 Botero was also influenced by Mexican muralism, with which he became acquainted while living in Mexico City. The monumental scale of the human forms in the murals gave rise to the voluminous figures for which he is best known. Botero's works make mordant comments on society's shortcomings; they also incorporate classical elements and are imbued with political satire and caricature. Signed and numbered 172/200 in pencil (there were also 18 artist's proofs), published by Harry N. Abrams Editions, New York, framed.